Simply Sofas are delighted to offer the excellent Dino Jumbo Cord Fabric & Faux Leather Panel 3 Seater and 2 Seater Set Corner Sofa Footstool. With so many on offer today, it is good to have a brand you can trust. The Dino Jumbo Cord Fabric & Faux Leather Panel 3 Seater and 2 Seater Set Corner Sofa Footstool is certainly that and will be a excellent purchase. For this reduced price, the Dino Jumbo Cord Fabric & Faux Leather Panel 3 Seater and 2 Seater Set Corner Sofa Footstool comes highly respected and is a popular choice with lots of people. Furniture Stop have provided some excellent touches and this results in good value for money. Made from the highest quality product, our sofas include foam filled cushions to provide additional assistance and convenience plus scatter back cushions. Two-man white glove shipment will provide in your living room. Scotland, Channel Islands, the Isle of Wight, the Isle of Man, the Scilly Islands, the Scottish Highlands & Islands and Northern Ireland. 2-MAN Delivery SERVICE in ENGLAND & WALES ONLY - Our couriers will deliver the items in your house ground or 1st floor - (NO DELIVERIES TO SCOTLAND or NORTHERN IRELAND or Isles)**Please check description below for delivery details and information on non-deliverable addresses Call us on 07939524973 to let you know if we deliver to your address and approximate delivery dates (Furniture Stop Ltd) FAUX LEATHER ON PANEL FRAME & JUMBO CORD CUSHIONS - Faux leather combinations available in Brown & Coffee or Black & Grey. Orientations available in Left Hand & Right Hand. 3 Seaters & 2 Seaters sets are also available. We use quality foam and fibre filling sofas in these sofas to ensure they will last long. FIRE RETARDANT - According to UK law *Fire Safety UK BS 5852 Compliant* - Be aware of dangerous copies using unqualified materials. LARGE REMOVABLE FOOTSTOOL- The Corner Sofas have a large Removable Cushion Footstool At The End. 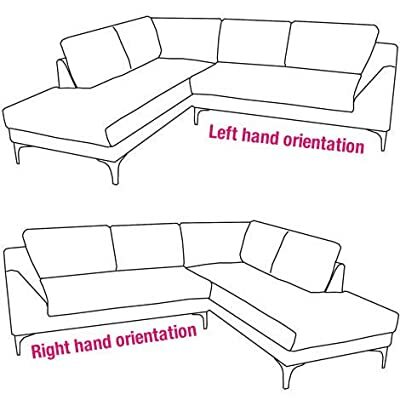 Not included in 3 & 2 Seater Sets alone. 1 YEAR FACTORY WARRANTY - Quality & Modern Style. We use quality foam and fibre filling cuhions in these sofas to ensure they will last long. This sofa is made from a combination of luxurious textured jumbo cord fabrics, it has soft seating and back cushions which are fibre-filled and reversible for an even wear. The cushions come off so you can wash them. The Dino has been designed with size in mind for most homes in the UK with a low profile, resulting in a 'sink into' seating sofa range which will make a wow factor to anyone who will sit on to.Check description below for dimensions and more details. Item titles are describing what is included in the payable price.